Pixalate recently released the Q3 2018 Ad Fraud Report, and our data shows that social networks don’t just have a fake follower problem: They have an ad fraud problem, too. Social Networking’s big ad fraud problem is not just costing advertisers millions of dollars. It’s also disrupting the promise of personalization, which is essential to almost every social-focused ad campaign. According to Pixalate’s data collected through Q2 and Q3 2018, Social Networks are among the riskiest app categories for advertisers. Note that this data does not include walled gardens, such as Facebook, Twitter, etc. See more in our Q3 2018 Ad Fraud Report. 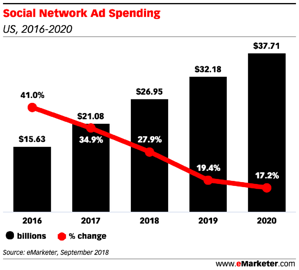 eMarketer estimates that $27 billion was spent on social network advertising in 2018, up 28% from a year ago. This number will grow to $38 billion by 2020. In terms of mobile in-app programmatic display advertising (within non-walled garden apps), about 20% of Android ads and 10% of iPhone ads go to Social Networking apps, making it one of the five most popular app categories for advertisers on a monthly basis, per Pixalate’s data. 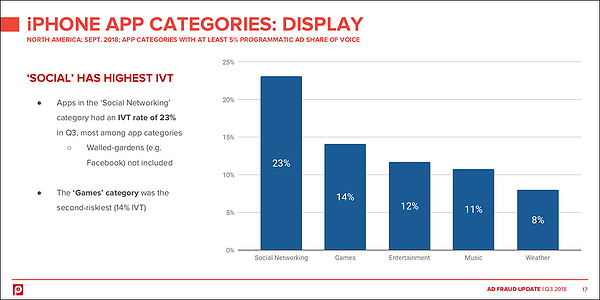 The popularity of social networking apps among advertisers — evidenced by eMarketer’s ad spend growth expectations and Pixalate’s analysis of which app categories receive the most ads — is problematic for advertisers when factoring in the high ad fraud rates. Social ads are also typically 2-3x more expensive. Per eMarketer, the average CPM for social is $5.23, while display is about $2 CPM (for the 300x250 ad unit). Fraudsters are attracted to social apps because of the high volume and higher CPMs. What advertisers think is a channel worthy of high volume and increased spend is actually riddled with invalid traffic. The ad fraud problem on social networking apps goes beyond lost ad spend. Audience targeting and personalization strategies are of the utmost importance to social advertisers. The high amounts of invalid traffic are messing up audience targeting algorithms and audience success reporting. Marketers see successful audience targeting reporting and are encouraged to increase social app ad spend, which amplifies the problem and creates a cycle of ad fraud. What constitutes a successful social media campaign on mobile apps needs to be redesigned. Too often do advertisers think they are targeting the right person on social only to later find out it wasn’t a person at all. What’s next for social apps? In addition to the brand safety concerns marketers are faced with on social networks — Marketing Dive reports that 45% of advertisers think social media sites “botch” brand safety — marketers are now faced with the reality that social apps also have a massive ad fraud problem. Advertisers need to thoroughly analyze their social network campaigns. How do you know the people you’re reaching are actual humans? Are you basing campaign success based on audience targeting or personalization metrics, and if so, how might a 10%-25% invalid traffic rate throw those metrics off? When done right, social networks can be a wonderful channel for marketers. The possibility of personalization does exist, but our data shows that it’s far from a promise, and marketers need to avoid the ad fraud minefield to achieve it. Working with an anti-fraud partner greatly reduces the common risks and lowers IVT. Pixalate will continue to track ad fraud and invalid traffic (IVT) rates within social networking apps to see if the problem persists, and we will keep you updated on our findings. For our latest, see the Q3 2018 Ad Fraud Report.